Individuals have the right to the pursuit of happiness in our country! Individuals have their own dreams and goals. But, some people have great difficulty in achieving their goals due to behavioral issues. Research has shown by using the methods developed with Applied Behavior Analysis individuals can learn the skills needed to make those dreams come true. 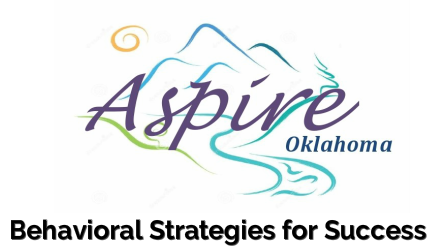 Aspire Oklahoma’s services are provided by individuals who have been trained in the use of Applied Behavior Analysis principles and methods. Services will be made available to children and adults who will benefit from it and then be better prepared to be on their way toward achieving their goals and dreams. Aspire Oklahoma will assist individuals in the development of positive behavioral skills needed to successfully navigate everyday life. In the area of NW Oklahoma there is no history of the use of Applied Behavior Analysis by Board Certified Behavior Analysts working with children. This business will provide behavioral intervention services to children and adults designed to increase positive behaviors in the family, school, community, and/or workplace environments. The managing members of the business have worked individually in this field, but believe there are new opportunities and better support in working together. Aspire Oklahoma believes that many more individuals can be positively impacted by the combined efforts and focus.